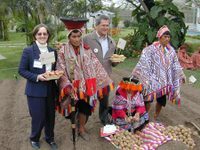 Dr. Pamela K. Anderson, (in photo above standing on the left with Peruvian potato farmers) a highly regarded entomologist and ecologist of the United States, has been appointed as the next Director General of the International Potato Center (CIP). Dr. Anderson will succeed Dr. Hubert Zandstra who has successfully led the Center since 1991. In making the announcement, Jim Godfrey, chairman of the CIP's board of trustees, said he was looking forward to working more closely with Anderson, continuing valuable work in improving the livelihoods of growers and communities of the developing world. Anderson joined the CIP in June 2002 as deputy director of general research. A leading expert on emerging plant diseases, Anderson has also done extensive research in virology, ecology, food production, human health and agricultural development for resource-poor farmers. She has worked in Latin America for more than 25 years, including over a decade in national agricultural research systems. Since joining CIP, Anderson guided the Center through a vision exercise, realigning the Center's reaseach and development program to bring it closely into harmony with the UN Millennium Development goals and targets.